A bomb dropped today. The White Stripes are no more. While I am still reluctant to believe that my favorite band is dead and gone, rather than write an obituary I’ll share what this remarkable duo has taught me since I first bought one of their records in junior high. 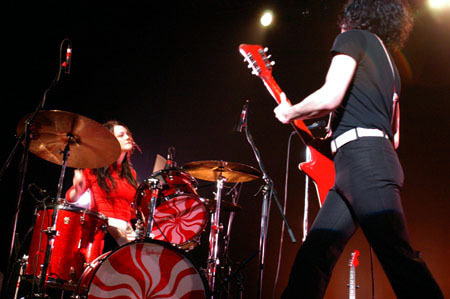 I consider The White Stripes to be among my greatest mentors, and their ideals and mythology will stay with me forever. Without further ado, here’s what I have learned from The White Stripes. There’s a reason that Jack White uses a cheap plastic guitar in The White Stripes, and it isn’t because it’s an advanced piece of equipment. Over the last couple of decades bands found new ways to change and distort their music using an assortment of fancy effects, and for the most part they only succeeded in masking an inherently shallow sound. The White Stripes never fiddled with any of these effects, and instead kept their sound raw, pure, and unaltered. They stripped rock down to its bare essentials, but they made sure those essentials were damn good. Technological advancements have been used to hide crap in virtually every artistic medium. Take Michael Bay's movies for example: no matter how impressive they look, they will never have soul. Plenty of blockbuster video games today can easily delight players with their graphics, but have a hard time pretending that they are not repackaged versions of games we’ve already played. I’m not saying that we cannot use technology to enhance art, but The White Stripes taught me that we should never create the skin before we create the bones. You can’t have a band with no bass. You can’t have a band without a skilled drummer. You can’t have a band with only two people. We’ve heard it all before. The White Stripes’ unique setup does not limit, it enables. Nobody before the The White Stripes sounded anything like them, and I’m willing to bet that nobody ever will. They’re so simple that they almost sound childlike, yet at the same time they sound more genuine than virtually every other band in existence. The White Stripes taught me to always embrace what I’m given, and it feels refreshingly free to live life without the fear of being limited. Rather than feeling incompetent in a tough situation, it is better to approach it as a unique challenge that will prove to be a valuable pursuit. To better relate this concept to games and entertainment, take a look at those that have found success on iPhone. Some developers feel limited by the lack of buttons on the device, and thus plaster virtual buttons all over the screen to compensate for this perceived limitation. The more inspired developers use the touch screen to enable them to create experiences that could never have worked with a conventional controller. The White Stripes play with no set list. They come out on stage with as much of an idea of what will happen as the fans that paid to see them. The result is true performance. I saw Arcade Fire play at Madison Square Garden over the summer, and although I’m a huge fan of them, their entire set reeked of over rehearsal. At one point, the drum machine malfunctioned in the middle of a song, and the band decided to start from the beginning. This would never happen at a White Stripes show. If something isn’t the way it should be, the duo finds away to create a different but equally interesting sound. Jack often performs without even tuning his guitar but manages to produce such a startlingly unique sound that audiences rarely even notice. While it’s never a good idea to underprepare for a matter of importance, I learned from The White Stripes that nothing of interest comes through sheer memorization. I often see students prepare for job interviews by manufacturing their own answers that they can recite should the corresponding question come up. To prepare for an interview I normally just make sure I know what the company and position entails, and in the actual interview I act the same way I always do when discussing my passion. It’s my way of making sure I always sound genuine and not artificial. Sometimes it works, sometimes it doesn’t, but I never once have felt underprepared, or worse, over rehearsed. The White Stripes go out of their way to struggle, even if the struggle is artificial. It’s their way of ensuring that they are always pushing themselves. In the documentary film It Might Get Loud, Jack White talks about how he keeps his bench far enough from his piano so that he must lunge forward to reach certain keys. He calls ease of use “the disease you have to fight in any creative field,” and this refusal to simplify the creative process causes his passion to bleed through all of his work. When working in creative arts, it is always tempting to find the simplest solution to a given problem, especially given the amazing technology we have to assist us. The simplest solution is rarely the best, however, and hard work is always evident in the final product. Take Lara Croft and the Guardian of Light, a game I nominated for Game of the Year. The simple solution for developer Crystal Dynamics would have been to create another Tomb Raider game in the same vein as their last three with new levels and a few fresh mechanics here and there. Instead, they created a game completely unlike anything the franchise had seen before, while preserving the core platforming and shooting elements that made the franchise fun to begin with. Just like The White Stripes, they forced themselves to operate outside of their comfort zone, and created what is in my opinion their best work yet. Jack White is an incredibly gifted guitar player, but not because he always hits the right note. Meg White’s drumming gives the band heart along with rhythm, but not because she’s a talented drummer. The duo’s phenomenal chemistry is a result of smothering each of their imperfections with an incredible amount of passion. Jack White doesn’t always play the best possible note on the fret board, but whatever note he picks is played so vivaciously that it becomes the perfect choice. Our generation is so obsessed with perfection that proficiency in a craft is almost always valued more than approaching it with passion. It’s passion, however, that turns a craft into an art. One of my favorite films of the year was Darren Aronofsky’s Black Swan. In the film, Natalie Portman plays a technically proficient ballerina that lacks the passion mandated by the role of the Black Swan. No matter how much she obsesses over every minor detail, she cannot lose herself in the craft. The White Stripes have never lacked this ability. When they are on stage, the rest of the world does not exist. They exert beautiful, raw power with each step and misstep alike. They are proficient enough to compel, but passionate enough to astonish. “The White Stripes do not belong to Meg and Jack anymore. The White Stripes belong to you now and you can do with it whatever you want. The beauty of art and music is that it can last forever if people want it to. Thank you for sharing this experience. Your involvement will never be lost on us and we are truly grateful." Thank you, Jack and Meg, for creating this experience for us. You rekindled the flame in rock ‘n’ roll, and your love and passion lit a fire inside of each and every one of your fans. Goodbye White Stripes, I will never forget you.